How we Met: After hours of online chatting, we decided to meet in person. I wanted first impressions to last and therefore dressed up before I went to his house. When he opened the door, I thought “wow he’s good looking”. We soon discovered that we have similar interests and even share the same birthday! From that day on we gradually spent more and more time together. Proposal: When I got home from work I opened the door to the song ‘Simply the best’ by Tina Turner, a house full of lit candles and a trail of red rose petals leading me to the lounge room where he sat waiting anxiously. The rug in the lounge room read, ‘Will you marry me?’ in thick red rose petals. He got on one knee, and asked ‘Will you marry me?’ Of course I said yes and we celebrated with a glass of champagne. Ceremony and Reception: Both were held at the beautiful Parkwood International Golf Course. We met with Rebecca, our wedding co-ordinator, who was very informative, approachable, friendly and always willing to go the extra mile. 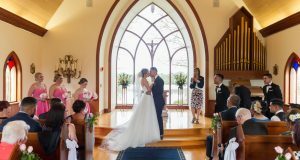 On our wedding day, everything ran smoothly, and Rebecca was on-site the whole time making sure that not only we, but all of our guests too, were relaxed and happy. 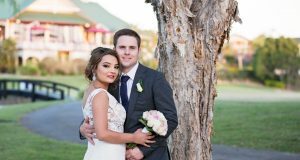 Celebrant: Robert Simmons was highly recommended to us, he made us feel very comfortable and got to know us on a personal level. Throughout the preparation, Robert was approachable and assisted us in writing our vows. Both our family and guests commented on his professionalism and positive attitude on our day. He helped make our ceremony enjoyable and ensured that it was a day to remember. Dress: As a little girl growing up, I always wanted a ‘princess dress’ when I got married. I found exactly that, an ivory princess gown from Pearl Bridal. With Cathy’s professional attitude and her warm approach she made me feel so comfortable whilst changing in and out of different garments. I purchased a sparkling broach from a seller on ebay and stitched it to the band under the bodice to give it the extra ‘wow’ factor. Bridesmaid Dresses: The design from Strictly Bridal was one of the very first I had looked at, and I fell in love with the style from the moment I saw it. The dresses were knee length, baby pink in colour and made from soft luxury chiffon fabric. Makeup and Hair: On the morning of our wedding, two professional beauticians from Allure Professional Hair and Makeup arrived early at our apartment ready to beautify us girls. Our hair and makeup lasted all day and night and I couldn’t have thanked the girls enough for the beautiful look they gave us. Photographer: From our pre-wedding shoot the talented Annie and David from Fotoforce created a stunning large matt print which we displayed at our reception for our guests to sign. It has become a wonderful memento from our day. On our wedding day Annie made everyone feel comfortable and captured every moment of our special day, we all had so much fun. Our wedding photos are incredibly beautiful, even better than we had ever expected and we will treasure them for a lifetime. We are forever thankful to Annie and David and highly recommend Fotoforce. Music: The ceremony commenced with the flower girl and the two stunning bridesmaids making their way down the aisle to the harmony of ‘Breath’ by Faith Hill. Anxiously awaiting this moment, I looped arms with my father and to the tune of ‘Cannon D’ by Mozart, I took my first steps towards my future husband. Cake: We chose a cupcake tower; a mixture of vanilla and chocolate swirl cupcakes complimented with delicious pink and white icing. On top of the tower we had a small mudcake covered in icing, complimented by a ‘bride and groom’ figurine. Advice: Brides, the morning preparing for the wedding goes so fast. 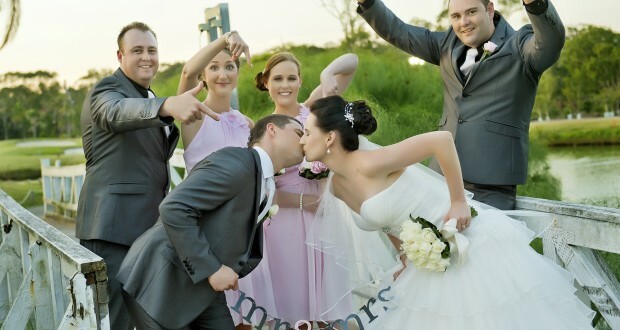 Create a schedule to ensure you’re not rushing and be ready for photos prior to the ceremony. Inform your bridesmaids, in the days leading up to the wedding, what your expectations are so as to avoid being a bridezilla on the day. Grooms, don’t rush into writing your speech. Allow yourself enough time to prepare and edit your work. Pace yourself with drinks, no one wants to see a drunk groom. Remember to use your teeth when taking the garter, no cheating and using hands. Take in every moment, watching your bride as she walks down the aisle as it’s a once in a lifetime experience. Honeymoon: Hawaii was spectacular and the food choices endless. We did a tour in Waikiki to the North Shore and saw some amazing waves and some beached turtles. Maui was the highlight of the honeymoon. We soon discovered why the travel agent told us to travel to Maui last. It was so relaxing and everyone there was in holiday mode. The serenity was breathless.